Landscaping does more than simply enhance the beauty of your home. Many landscaping designs also boost its value. If you’re considering selling and getting the most value for your home in the next few years, you’ll want to focus your landscaping efforts on designs that attract buyers who make high-dollar offers. Vertical gardens don’t just add beauty and depth to your landscape, they also create a nice sense of privacy that appeals to many buyers, encouraging them to offer more for your house. Living walls and vertical gardens are designed in such a way that they reduce energy consumption, which is an important feature to eco-minded home buyers. The multiple sections appeal to buyers who like to spend time outside and who enjoy having their own corner of the world where they can engage in specific activities. It also makes the yard seem larger. When landscaping with the intention of improving your home’s value, make sure you obey the strict letter of the law. 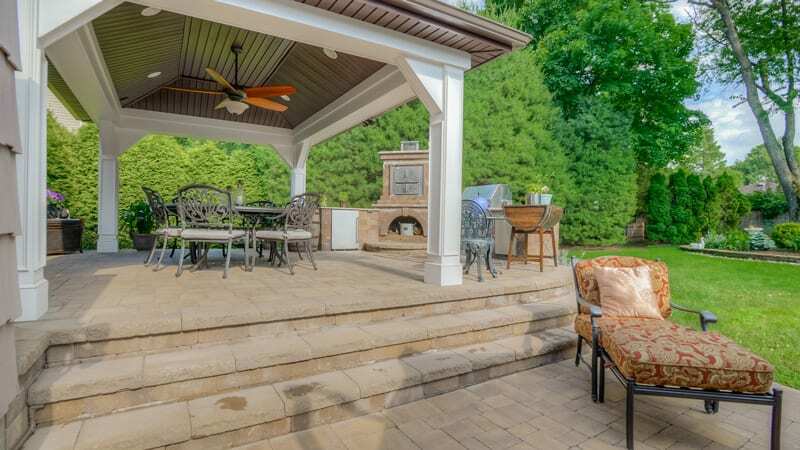 Projects like changing gas connections or adding a minor structure to your property might not seem like a big deal, but if done without the assistance of certified professionals like the ones you find at Sponzilli, you could inadvertently break NJ Building Compliance laws. Breaking these laws could result in a hefty fine. 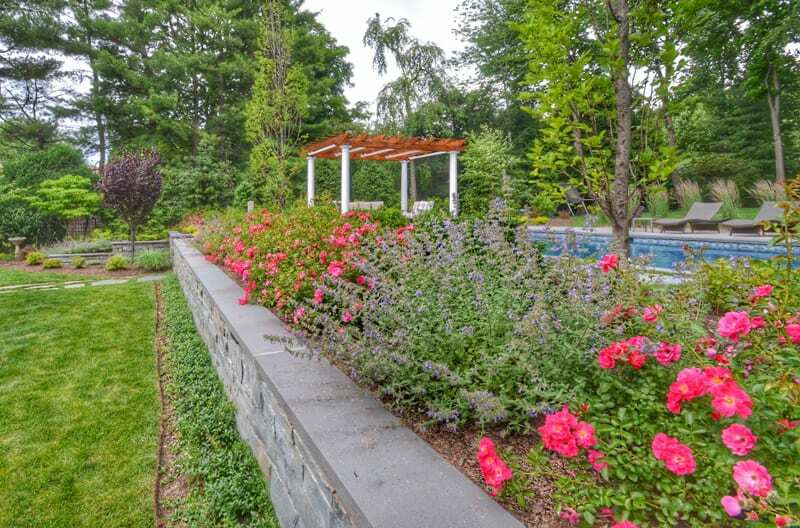 For more information about adding value to your property with landscape design and installation, contact us today! Our award-winning team is ready to make your property stand apart. 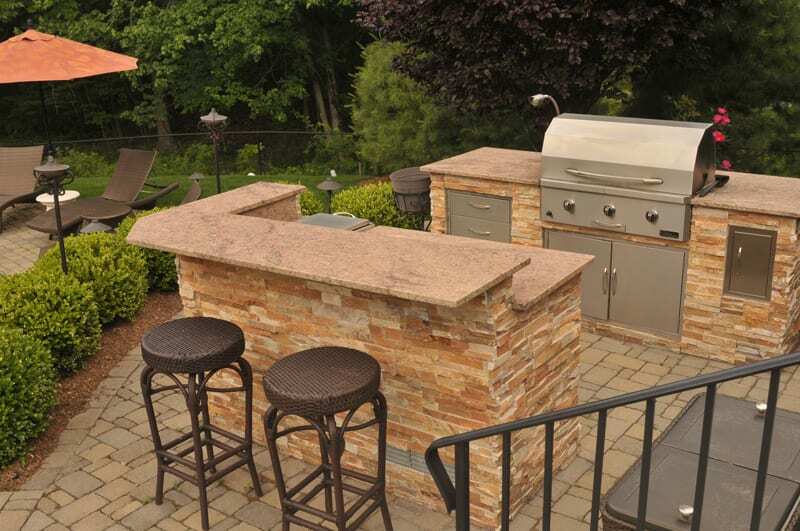 Concrete has been used as a catch-all in hardscaping for many years. It is a cheaper alternative to other hardscaping elements. Concrete is durable and can withstand the trampling of families and vehicles alike. The major downside to concrete is that it requires maintenance. In extreme weather fluctuations, concrete is liable to stain, become porous, and crack. Rocks are another cost-effective hardscaping material. Loose stone can be purchased in a variety of bulk colors, sizes, and shapes. This makes it a popular choice for individuals with a knack for design and color coordination. 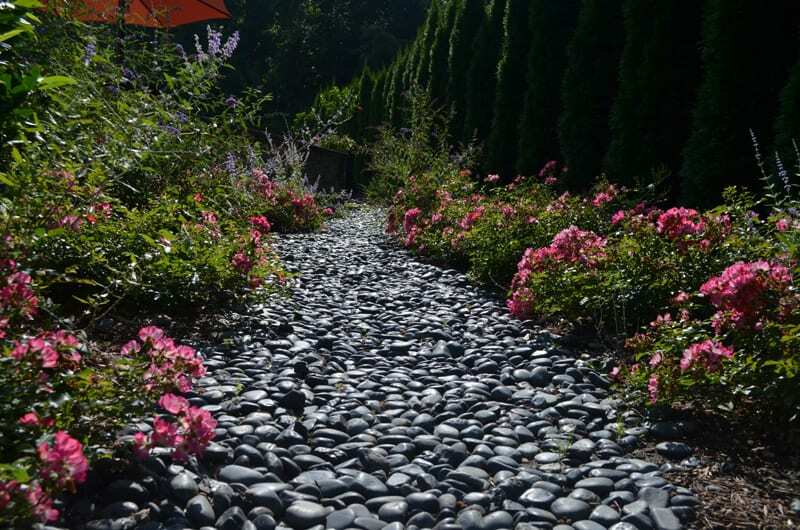 Unfortunately, rock is not a favored choice for outdoor living spaces or pathways because it’s not a flat, even surface. This can be dangerous in cooking areas or near pools. It can also make clearing off these spaces in the winter more difficult. Mulch is a cheaper and viable alternative to rock. Organic mulch is even good for the environment. When it breaks down, it can become a hotbed for nutrition that is great for most property owners’ plants. Mulch comes in colors that blend in with the natural colors of lawns and garden beds. Both stone and mulch are good options for specific areas of your landscape. They are perfect for adding depth and intrigue into a design but lack the stability and permanence of other options. All in all, there are a wide variety of hardscaping materials available to fit the needs of individual homeowners. By blending an assortment of hardscaping materials with your softscape you can maximize the look of your landscape design. Incorporate materials that fit your lifestyle, décor, and budget. Interested in getting a professional opinion on your hardscaping project? Contact Sponzilli Landscape Group for a free quote today! Jason Sponzilli, the Chief Operating Officer of Sponzilli Landscape Group since 2002, has a wealth of knowledge and experience in the landscaping industry. For six years he served as the Vice President of the New Jersey Landscape Contractors Association (NJLCA). Jason is a Certified Landscape Technician and a Certified Pesticide Applicator, a Certified Low-Voltage Lighting Installer from Cast & Unique Lighting, and a Certified Contractor for ICPI (Interlocking Concrete Pavement Institute).